French Consul, Michael Dancoisne-Martineau, was recently presented with an honorary Member of the British Empire (MBE) award by Her Excellency, Governor Lisa Honan, for his services to the promotion of Tourism on St Helena. 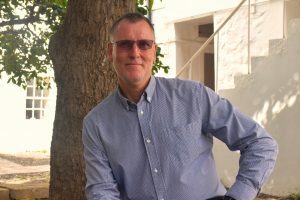 Michel has been on the Island for more than 30 years, during which time he has dedicated his services to the conservation of the Napoleonic Heritage on St Helena and promoted St Helena as a destination to the outside world. He is the Director and Curator of the French Properties and has worked tirelessly to ensure that they are maintained to a world-class standard. The restoration of furniture culminated last year in an International Exhibition, entitled ‘Napoleon on St Helena’ and was held in Paris. The event was a resounding success, attracting thousands of visitors and stimulating huge interest in St Helena as a visitor destination. Michel has written several books about the Island, both on the Napoleonic period and the Island itself. He has served on a number of voluntary organisations and charities like the Arts and Crafts Association, the St Helena National Trust (SHNT), and the Royal Society for the Prevention of Cruelty to Animals (RSPCA), to name but a few. Michel has shared his love for art by contributing to locally organised art exhibitions, and on one occasion, organised an exhibition of his own personal collections of sculptures. “It is in recognition of all these valuable services that Her Majesty, The Queen, has appointed Michel to be an honorary Member of the Most Excellent Order of the British Empire.